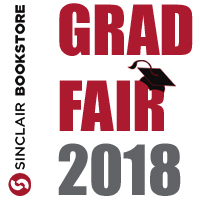 Pick up your regalia and get registered for Sinclair’s commencement ceremony! Shop for Alumni clothing, diploma frames, class rings and other graduation gifts! Meet with reps from area colleges, financial institutions and Sinclair student services! Hop in the photo booth with family and friends and take home a Grad Fair memory! Help yourself to light refreshments, enjoy games and enter our Grad Fair prize raffle!